Here is a video exposing a false teaching (a prophecy rumor), that is making the rounds on the Internet, YouTube, and various other places. Once I expose and dismiss the false teaching we begin to study real Bible prophecy! So, get your Bible out and join in with me, and lets study real Bible prophecy for a change! I hope this video is a blessing, and spurs you on to read and study the Bible for yourself! Follow along in your Bible with the teaching, and may the Lord bless you with his Word. I would like to say hello to everyone as we celebrate Memorial Day here in the United States. This is the day we remember American soldiers who have died in active military service. We celebrate their service, their lives, and the sacrifice they and their families made for our country. All of them are heroes in the truest sense of the word. As Jesus said, “Greater love hath no man than this, that a man lay down his life for his friends” (John 15: 13). As for my writing ministry, I intend to continue working again on a new book I started last fall. I suffer from severe asthma and last September I was exposed to cigarette smoke for only a short period of time. As a result of that exposure I became very ill, and at one point during winter, I thought that if my time here on Earth is finished, and the Lord wants to call me to Heaven, I am ready to go. But, praise the Lord for His grace and mercy, and over the following months I began to feel His healing touch as many Christian friends prayed for my recovery; also, I am thankful for the skill of several wonderful doctors who provided personal care. As a result of these things my full recovery began at the end of March, and since that I time I have regained physical strength and am happy to report I even have that burning desire to once again apply my time and efforts to writing and speaking as the Lord leads. While I tried to maintain the blog and the Alien Antichrist Facebook page during my illness, I am sorry that I was not able to write more. But now that I am recovered I look forward to writing more articles, and commenting more on news items I place on Facebook. Also, I hope to make a few teaching videos this summer, so keep an eye on the blog for those things. As always, my articles and videos are available free of charge. It does take money to print books, and so my books will continue to be sold through Amazon, Barnes and Noble, and in other fine bookstores. Please keep me in your prayers, and the work of exposing the end-game of our spiritual enemies will move forward as the Lord leads. We are living in a time of great deception: not only do we have the alien and UFO deception, but many Christian churches are filled with spiritual apostasy. In the Pentecostal and Charismatic church there are many false prophets, and many strange and aberrant doctrines being taught. In Evangelical churches Contemplative Prayer, which is a form of Eastern meditation much like Transcendental Meditation, is spreading like wildfire. And to top it off there are false “revivals” with strange manifestations of demonic power; and the most dangerous manifestation is the release of a kundalini spirit (a demonic spirit masquerading as the Holy Spirit), among many undiscerning Christians. The deception is so powerful it reminds me of the words of Jesus: “For false Christs and false prophets shall rise, and shall shew signs and wonders, to seduce, if it were possible, even the elect” (Mark 13:22). When I say these things I am not sitting here as an armchair quarterback (I am a Charismatic Christian, and I attend a balanced Charismatic church), I am speaking from experience: I have personally witnessed the release of the kundalini on several occasions–in Christian churches. It is vital to understand what is happening because it all leads to the acceptance of the Alien Antichrist. Its like baby steps: one thing leads to another until the Man of Sin makes his grand appearance. I will be writing about these things in the coming weeks, so keep watching the blog for new material. Thanks for visiting, and for your understanding during this very trying time. All I can say is that “When the enemy comes in like a flood, the Spirit of the LORD shall lift up a standard against him” (Isaiah 59:19b). On my birthday, Sunday August 30th, I will place all of the names in a hat and pull one out for the free book. Once the drawing is held all of the names and email addresses will be destroyed. I don’t sell names, nor will I bug anyone for anything. Please note, if you are the winner I will notify you and request your mailing address. Also, I will sign the book and personalize it if you wish! The last day to send your email entry is August 29th. On August 30th, 2015 at 6:PM EST U.S., I will announce the winner. I will use only your initials, and state or country–no last names, or specific locations will be mentioned. Here are a few articles I currently have on Facebook. There is a guy in Queensland Australia who claims he is a carbon copy of the image on the shroud of Turin! Sadly, he also has followers, people who really believe him. What did the real Jesus of Nazareth say? “There shall be false Christs and false messiahs…And false prophets shall arise and deceive many…Then if any man shall say unto you, lo, here is Christ, or there, believe it not…. Wherefore if they shall say unto you, Behold, he is in the desert; go not forth: behold, he is in the secret chambers; believe it not. (See Matthew 24). I can’t add to the words of Jesus of course, but I might throw in just a few words of commentary–there shall be false Christs even in Australia. Here is a link to a video taken in Osaka Japan. Approximately ten luminous objects can be seen floating across the sky. Years ago I saw something similar driving across Indiana. 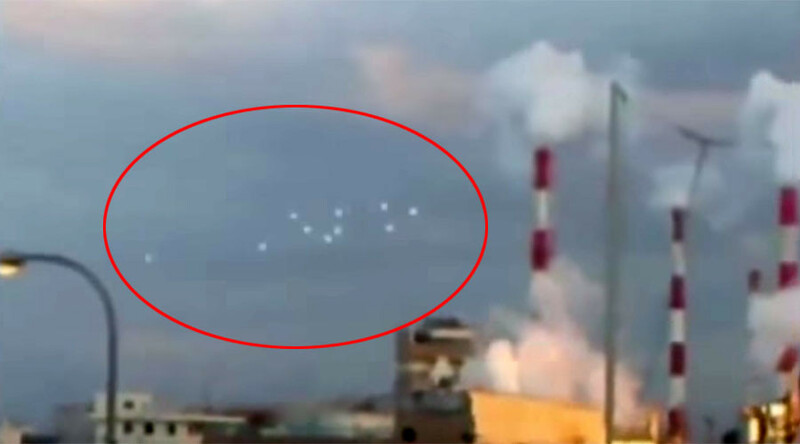 About 15 luminous objects displayed across the sky, facing east, in two groups, at the ten o’clock and two o’clock positions. The fallen entities responsible for creating UFOs can manipulate vast amounts of energy and matter. This can result in the glowing orbs as seen in this video, or, if the entities choose, the matter can form into a solid nuts and bolts craft. Just another example of the great deception that is coming. In my book, Alien Antichrist, I explain from a biblical perspective what UFOs and aliens are, why they manifest, and how the phenomena will be used to deceive the whole world, causing people everywhere to worship the Beast as revealed in the book of Revelation. It’s all part of the Strong Delusion the Apostle Paul wrote about. 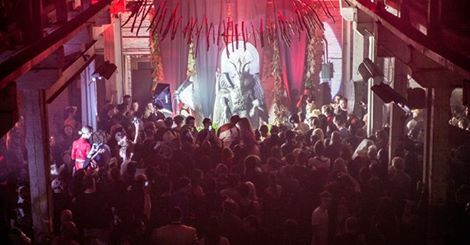 Satan worshippers gather in Detroit around Baphomet. There is an update to the Baphomet ceremony in Detroit. As it turns out, to prevent the infiltration of the ceremony by Christians, attendees of the event were forced to sign a pledge, as a condition of entry, that they would irrevocably sell their soul to the Devil! That’s astonishing when you think that over 700 people attended the event and signed the pledge. Here is a link to an article about this. The author of the article quotes a Catholic Jesuit Priest, who says they don’t know what they are playing with. While I strongly disagree with Catholic theology, and especially the Jesuits (if you know their history you know why), this priest nails the issue on the head. These people think its cool, or hip, to sign such a pledge, and attend an event like this. They truly do not know what they are playing with. I myself have seen evil spiritual powers at work and it can be very frightening to witness. Of course the power of Christ conquers them every time, but this stuff is nothing to toy with. Satan and his fallen angels take themselves very seriously, and to play up to them in such a manner is, without exaggeration, nothing short of extreme foolishness. It’s not a game, and the consequences are eternal. 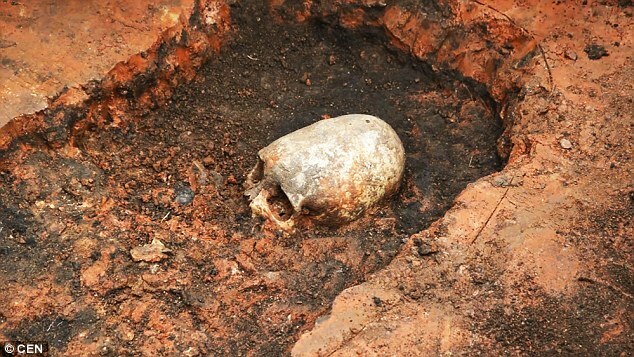 Elongated skull unearthed in Russia. ALIEN SKELETON FOUND ON MARS! What is an alien skeleton doing on Mars? It looks like a rock to me! Looks like the Mars watchers have found an alien skeleton. 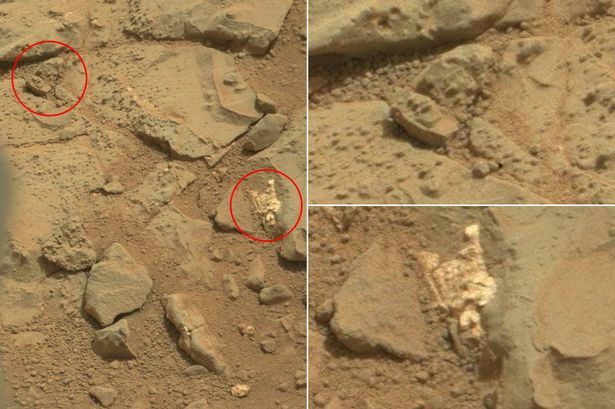 While some are saying this is evidence of past life on Mars, rather than a skeleton, it appears to look exactly like a light-colored, odd-shaped rock. And upon closer inspection of the photo, it is a rock. I speculate in my book, Alien Antichrist, that it is possible scientists will stumble upon an artifact on Mars, the Moon, or Earth, that will be used to “prove” aliens exist. This is all part of the conditioning process to accustom us to the idea of aliens. The future is going to be an interesting ride! The Antichrist and the Beast system of Babylon the Great are both important components of the prophetic picture in the Bible. Get the book, increase your knowledge of Bible prophecy and you will not be caught off guard. You may get the book at Amazon, Barnes and Noble, and at other fine bookstores as a print on demand title. And, if you have Kindle Unlimited or Kindle Prime you may download a copy through those programs for a limited time! Thanks again for visiting. I hope that my articles are a help to you. Please send your questions, comments and suggestions. I would love to hear from you! 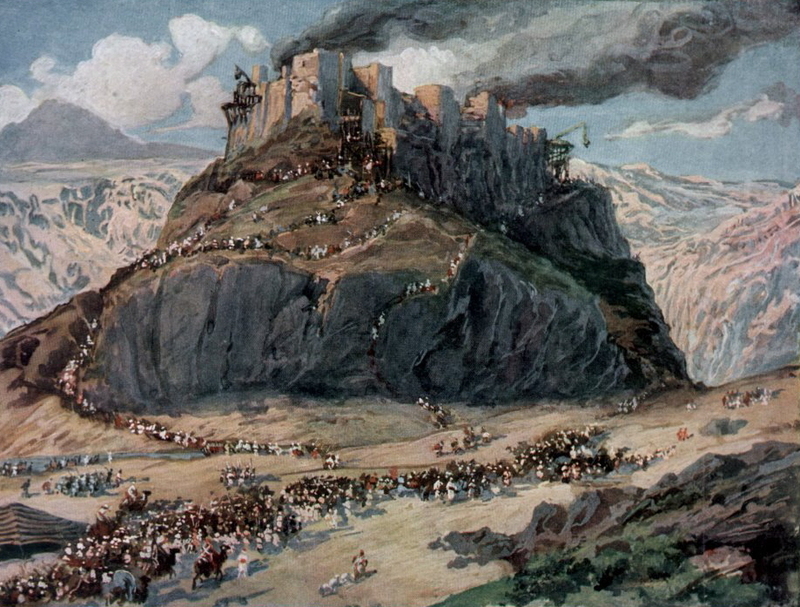 The Conquest of the Amorites; watercolor circa 1896–1902 by James Tissot. So far in the series we have looked at the biblical links to the number of the Beast, 666. As we have learned, there are some very interesting correlations between the number and it meaning. Lets look at another aspect of this number. Revelation 13:18: Here is wisdom. Let him that hath understanding count the number of the beast: for it is the number of a man; and his number is Six hundred threescore and six. In earlier parts of this series we learned that one of the men John wanted us to examine was king Solomon and his link to the number 666, as well as the evil apostasy he led the nation of Israel into near the end of his rule. Solomon abandoned the God of Heaven for the occult gnosis or hidden knowledge of the god of this world, Lucifer, the Light-Bearer. The Apostle Paul warned us about the abilities of Lucifer/Satan to alter his appearance so that his doctrines look very appealing to humanity. 2 Corinthians 11:14: And no marvel; for Satan himself is transformed into an angel of light. As most of you know, Lucifer and his fallen ones still come to humans as an angel of light, bearing gnosis or knowledge that appeals to “the lust of the flesh, the lust of the eyes, and the pride of life” (1 John 2:16). He still wants us to pluck fruit from the Tree of the Knowledge of Good and Evil, but in the end the fruit he offers is actually bitter poison. It destroys our relationship with God, with other people, and can lead to a very bitter end for many, not just in this world, but in eternity as well. Before the ancient Israelites entered the Promised Land Moses sent 12 spies to examine the land and its inhabitants. God had promised a land flowing with milk and honey, which is a way of saying that the land would be a land of blessing, bounty, and plenty. All of their needs would be met once they entered the land, conquered its inhabitants, and began a new life under the authority of God. 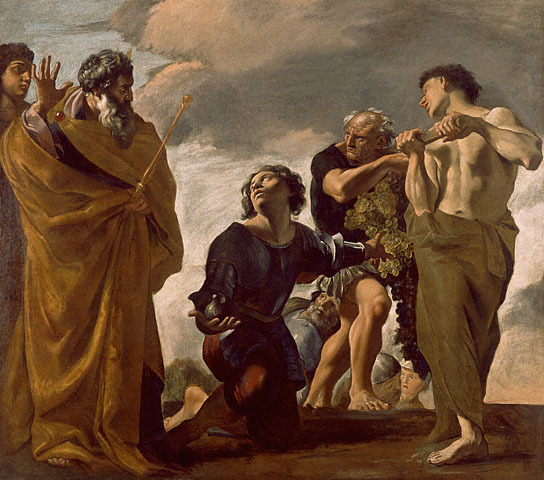 Moses and the Messengers from Canaan, by Giovanni Lanfranco, 1621-1624. After the 12 spies returned from their exploration, 10 of the men brought an evil report which discouraged the majority of the children of Israel from entering the land. They said they saw the Nephilim giants and refused to believe that God would help them conquer the giants and take the land. 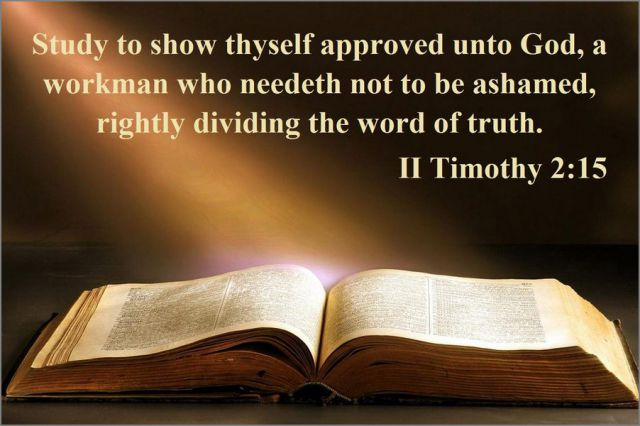 As many of you know, because of this heart of unbelief God banished the unbelieving generation to the wilderness for a period of 40 years, or, until they were all dead. In the end their children entered the land and conquered the Nephilim giants under the leadership of Joshua. One of the 12 spies was a man by the name of Sethur, and his father’s name was Michael. It is here in the book of Numbers that we see another clue revealing 666, the number of the Beast. And remember, it is the number of a man, so here is another man with a connection to the number. Numbers 13:13: Of the tribe of Asher, Sethur the son of Michael. This is the one place in the Bible where it seems the gematria works out to 666. As strange as it seems, once we examine the meaning of the names it will become abundantly clear why the Holy Spirit placed this signpost in the ancient book of Numbers. The following is adapted from my book, Alien Antichrist, The Terrifying Truth about UFOs and Aliens, Antichrist, and the End of Days, and as such this research is copyright 2014, Jeffrey A. Wingo. This verse is from a listing of families who are returning to Jerusalem from Babylon after the 70 year captivity. It seems so strange to have information about the number 666 at this point in Scripture, but there is a very good reason it is placed here. The first clue is the city of captivity, Babylon. And Babylon the Great will be the city of captivity during the Great Tribulation (see Revelation chapter 18). Also, a rebuilt Temple in Jerusalem will one day be the focal point of the entire world when the Antichrist Beast enters the sacred precincts of the Temple, proclaims that he is God, and demands that the Jewish nation of Israel and the world worship him as such. When put all the clues together we find they point directly at Apollyon/Abaddon, the Beast from the abyss. A Babylonian Lord Rising up, the Hidden One, the Destroyer, Who is like (or desires to be like) God. “It is very clear that all of this points to Apollyon the Beast from the abyss! At present he is hidden away in Tartarus. His name means destroyer, and he desires to be like God. In his former days he was the king of Babylon, and when he is released from the abyss he will once again assume that title and position as the king of an Empire called Babylon the Great.” From Alien Antichrist by Jeffrey A. Wingo, pgs. 240-241. It should be abundantly clear that all of the information in this series of articles reveals the identity of the Antichrist as the Beast from the abyss. I realize this may not satisfy every person out there, but the information I have given you is BIBLICAL, that is the main thing. There is too much information out there based on speculation and opinion, but my point is that we need to get back to the Word of God, the Bible. Also please note that my information comes from the authorized King James Bible, so if you are using a modern translation you may find that some of this information will not be revealed by a few of the more modern translations, especially paraphrased creations like one as loose as the Message Bible. I am not King James Only, and I am certainly not legalistic about Bible versions, but if you do some checking you may find that the old venerable King James Bible was put together by godly, scholarly, men who translated the Bible using very strict protocols, and they didn’t play linguistic gymnastics like some of the other versions seem to do at times–just my opinion, yours may differ on this subject! I would love to hear from you! My email is jeffreyawingo@gmail.com , or you may just comment on the article page. My Facebook page is found at http://www.facebook.com/alienantichrist . I put comments and links to interesting articles on the Facebook page that you may also like to read. If you would like to learn more about the Antichrist and the Beast system of Babylon the Great then I recommend to you my book Alien Antichrist, The Terrifying Truth about UFOs and Aliens, Antichrist, and the End of Days. The Antichrist Beast and the Beast system of Babylon the Great is an important component of the prophetic picture in the Bible. Get the book, increase your knowledge of Bible prophecy! You may get the book at Amazon, Barnes and Noble, and at other fine bookstores as a print on demand title. And, if you have Kindle Unlimited or Kindle Prime you may download a copy free for a limited time! Thanks again for visiting. I hope that my articles are a help to you! 1. Strong’s H5639 – Cĕthuwr; Sethur, hidden. 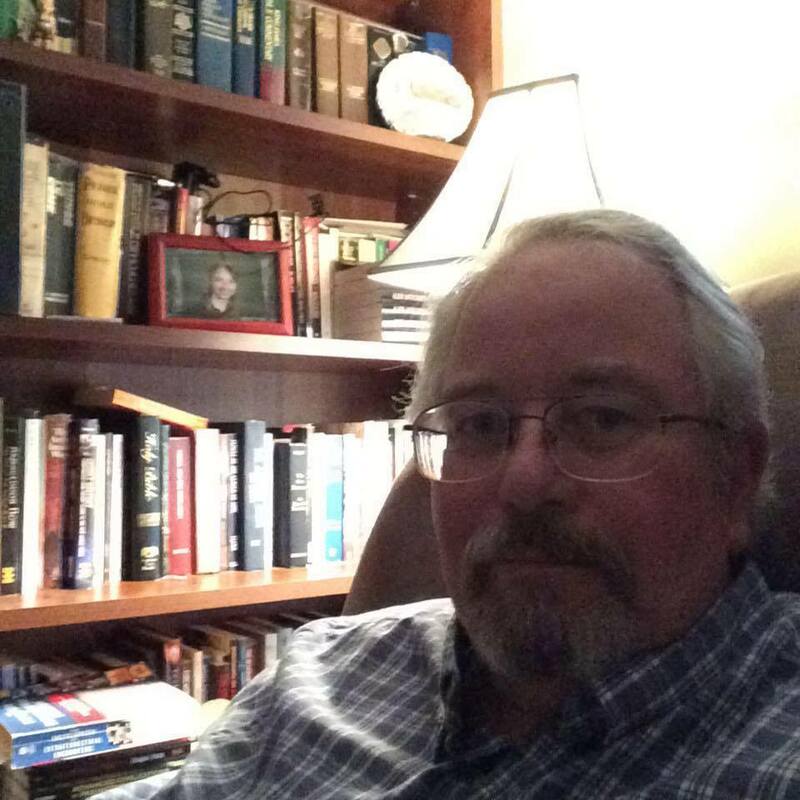 See also Hitchcock’s New and Complete Analysis of the Holy Bible, Roswell D. Hitchcock, 1869; Easton’s Bible Dictionary, 1897; Adam Clark Bible Commentary, 1831. 2. See Brown, Driver, Briggs, 1906, Strong’s H4317. 3. This is based on research in my book Alien Antichrist, Terrifying Truth about UFOs and Aliens, Antichrist, and the End of Days, by Jeffrey A. Wingo (CreateSpace 2014); page 239. 5. Strong’s H140 – ‘Adoniyqam . See also comments by Dr. John Gill on Rev.13:18. Gill’s Exposition on the Entire Bible. 6. Dr. John Gill, Gill’s Exposition on the Entire Bible. Comments on Revelation 13:18. 1. The Conquest of the Amorites by James Tissot. 2. 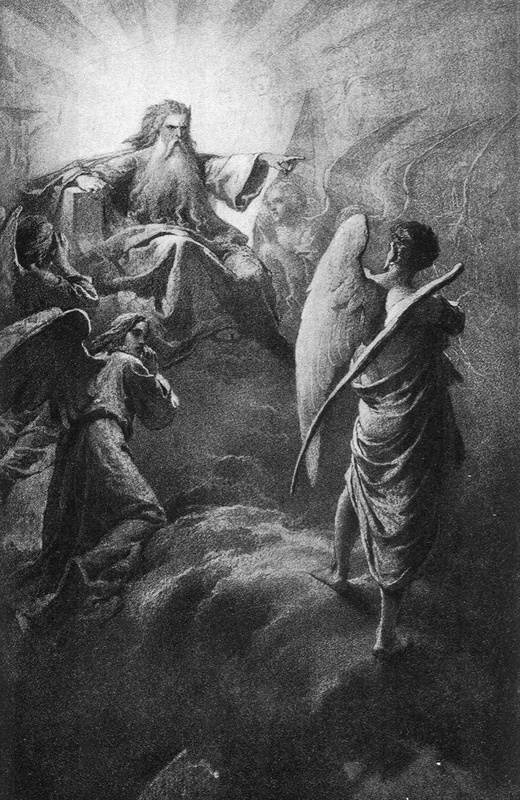 Lucifer before the Lord, by Mihály Zichy. 3. Moses and the Messengers from Canaan by Giovanni Lanfranco. 4. 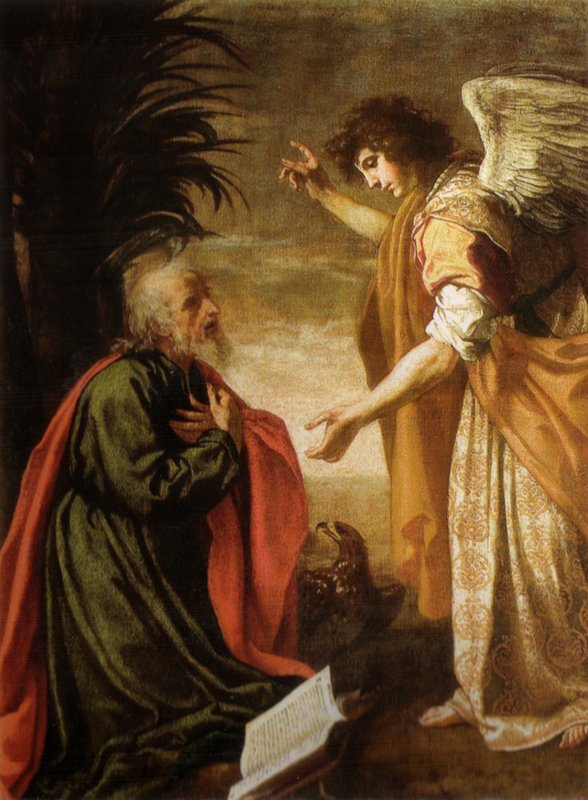 John the Apostle on Patmos by Jacopo Vignali. In this video I talk about my purpose for writing the book Alien Antichrist, and how the Great Tribulation will be characterized by an unprecedented outpouring of supernatural evil all across the world.